A few months back, a flight I was on from Melbourne to Sydney got cancelled and I ended up having to chase Virgin through numerous phone calls to get a refund processed. Being the large annoying company that they are, instead of just refunding to my credit card, they credited the flight costs to their Travel Bank credit/refund account service which is supposed to be a unified way for handling all nature of refunds and credits. Your password is too long and secure! Please reset it to something shorter, like “password123”. After cursing this booking system for some time, I figured that I could just go and change my password to something less secure via the separate Travel Bank interface in order to work around this bug in their system. Except that there’s no option to change a Travel Bank password, infact, there’s almost no options within Travel Bank itself. Wondering why I have an “Administrative Entry”? That’s because it took 3 phone calls to get them to correct refund a flight as each time they kept refunding only one passenger but not the other. Staff had to do a special admin entry to “fix” it. Failing that, I figured maybe the Password Reminder/Forgot Login Details feature could work. Generally forgotten password reminder systems will generate a new password and email it out, which would solve my issue. 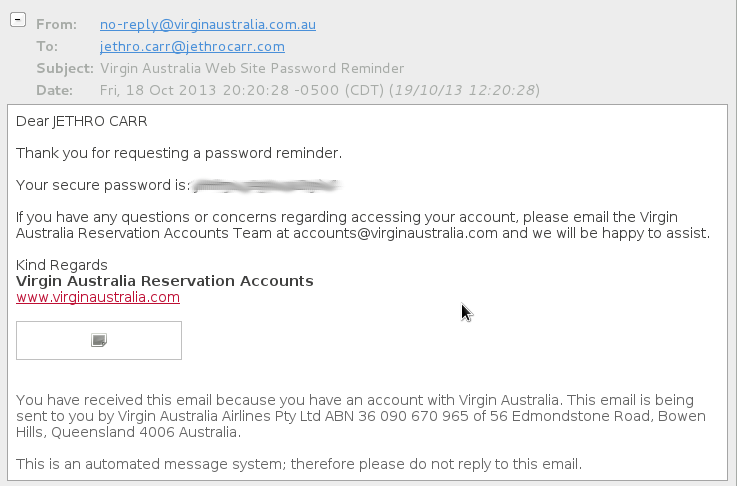 Except that Virgin emails out the password you have set, in plain text… a text book example of poor computer security. because it means any Virgin staff member with access to that system can read customers passwords and in event of a security exploit, an attacker could potentially harvest thousands, if not millions of plain text passwords that might have been re-used with member’s other sites, such as their email, banking or social media sites. This is why it’s good practice to always use a unique password for every website and use a password manager of some nature to handle all your password storage and retrieval. I’m not angry Virgin, I’m just very disappointed. I think someone needs to update their FAQ. In the end, it took me 30mins on the phone to get the agent to determine that there is infact, no way to reset a Travel Bank password (even from their end), and to do a manual phone booking for my trip in order to allow me to use up the credit. This entry was posted in Uncategorized and tagged airlines, fail, opinions, security, travel, virgin. Bookmark the permalink. Firstly, thank you for your feedback and taking the time to let us know of your recent experience. It is with regret to learn of your dissatisfaction and difficulties you have experienced with our Travel Bank functionality, I do sincerely apologise for the inconvenience this has caused. Please rest assured all feedback provided by our valuable guests is an integral part of our business improvement plan. As such, your individual comments and specific concerns will be investigated and distributed to the relevant Information Technology managers within the airline via our comprehensive feedback reporting system. I can also advise that we are in the process of upgrading our website, additional changes will occur shortly enhancing our guest’s online experience. We are confident these enhancements will assist in alleviating the concerns you have raised. I do hope you give us an opportunity to welcome you back on board one of our flights, and provide you with the high standards of service we pride ourselves upon. Whether this will translate to an actual improvement will yet to be seen. no they haven’t changed a thing. Still same non-sense and greater “clever” way to put customers off. When you want to purchase a ticket , they rip you off an extra $30. 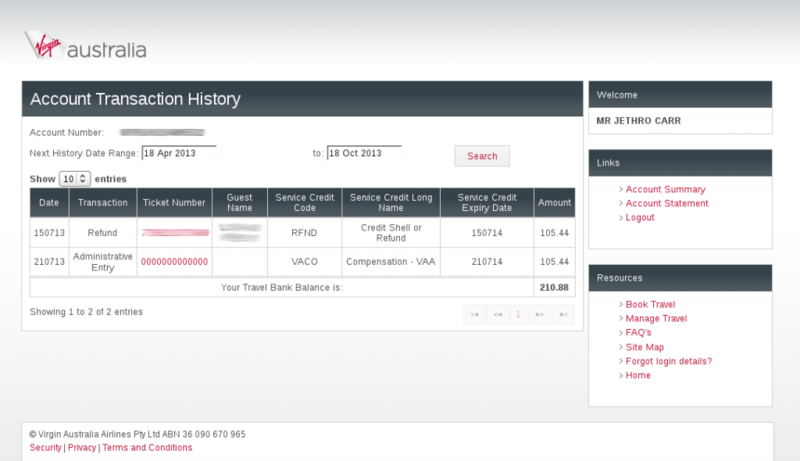 This is due to , any extra difference you can only pay via credit card incurring extra $30 charge. Hence unless you find a flight exactly matching your credit amount. You are left with either paying 1)ticket+$30 extra or 2) give up remainder $$ by buying a cheaper ticket than your credit amount. How do you feel ? Are we stupid enough to not see what Virgin is doing ? Whoever created this customer loyalty program in Virgin and whoever sponsored this program deserves an big applause. Because not only it is the best way to ensure loyalty goes away but people do refunds often and do eventually find out your mechanism quite amusing through social media.